To see how to shape the roses, watch the video at https://youtu.be/Z8P070kC3oo. Instructions: Prepare a white card base 5 1/2 x 7 1/2". Using a piece of Kraft cardstock, tear all 4 sides and add foam dots to the back, ink the edges with the Coffee ink and adhere to the card base. 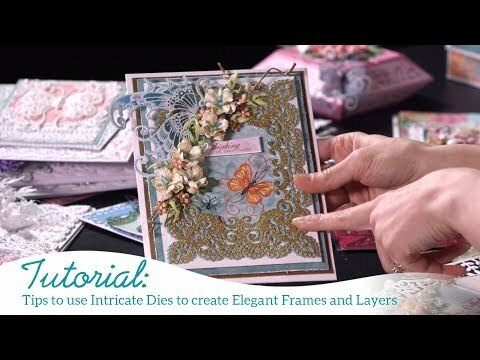 Cut the Intricate Swirl Frame out of white cardstock, add foam dots to the back and adhere to card. Tear another smaller piece from the Kraft cardstock, stamp the sentiment with the Coffee ink, add foam dots to the back and adhere to card. Stamp the leaves on white cardstock with the Olive ink, color with the Leaf Green, cut out using the matching die, shade with the Fern Green, shape and adhere to the bottom of the card. Stamp the flowers on white cardstock with the Deep Purple, color with the Majestic Violet, cut out using the matching die, shade with the Cactus Flower, place in the Roses flower mold, finish shaping with the Flower kit and arrange on top of the leaves. To finish add prills to the center of each flower and glitter to both the leaves and flowers.